Knit One Quilt Too offers beginner, intermediate, and advanced level classes in knitting, quilting, weaving, embroidery, sewing, needlepoint, and crochet. To register, call (401) 337-5578 or stop by. Some classes require no pre-registration. 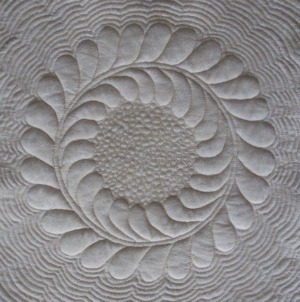 Gain confidence in machine quilting complex quilting motifs on your domestic sewing machine. Each week will focus on one or two topics, with plenty of time for in-class practice. You will bring your own sewing machine so you can become completely familiar with its features. Topics covered include materials (thread, needles, and batting), machine setup, basting, tension, marking, straight-line quilting, basic meandering, cross hatching, feathers, design selection, and much more. Class size: Maximum of 6 students. Sign up early as the class fills quickly.